Web sites use templates called skins, themes, and styles to describe how web sites can be modified to change the look and layout of a web site without changing the content. Wordpress, Blogspot, DotNetNuke and others all provide the ability to modify the color, layout and style with thousands of templates that are available. Many are free, some cost only a small fee. The ones that do cost something range from less than $50 to about $200 for a bundle. One of the greatest sites to extol the virtues of using CSS to modify layout, colors, images, and style of a stie but using the the unchanged same content is the CSS Zen Garden. A lot of significant design effort went into the styles used at the CSS Zen Garden, but they look great. Predesigned themes can be invaluable for a small business or organization operating on a limited budget. Something that would cost $3000 to $6000 or more to have a custom designer generate, can be obtained for less than $100. There a new web site engine making headway in the market today called BlogEngine.NET. It's been very popular as more and more new features become available. 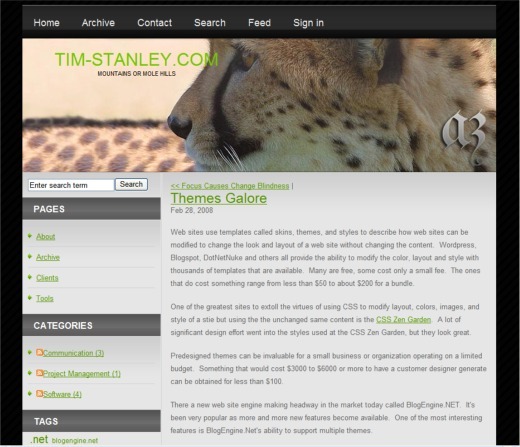 One of the most interesting features is BlogEngine.Net's ability to support multiple themes. ** - these are definately worth taking a look at. * - you might be interested. Several of the themes were created by Jesse Foster. Jesse explains more about how the different layouts are accomplished in his post on Layout Gala.